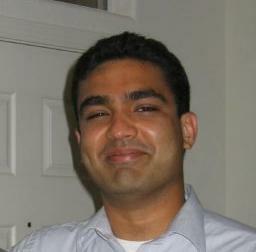 When Anuj worked at Kana, he would often travel to New Hampshire from the Bay Area. Kana had merged with another company located there and maintained that office after the deal closed. Many of the product development people he worked with were based there. Six years ago this week, Anuj was in New Hampshire on just such a business trip. After a few days of working with the engineering team there, he stayed the weekend to participate in the Reach the Beach Relay. Kana had entered a team in this 200-mile race and Anuj was of course excited to participate given his love of running and perpetual desire to challenge himself. Yes, running was yet another sport he actively engaged in. 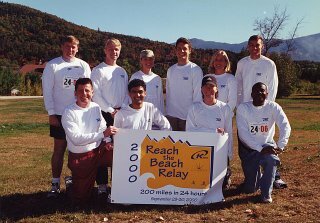 Reach the Beach is the longest running relay race in the United States and raises money for numerous community organizations in New Hampshire. Its picturesque course cuts through the state during the early Fall foliage season starting in the Bretton Woods high country and ending at the Atlantic coast in Hampton Beach. Despite the scenic course, the race itself is a grueling competition. 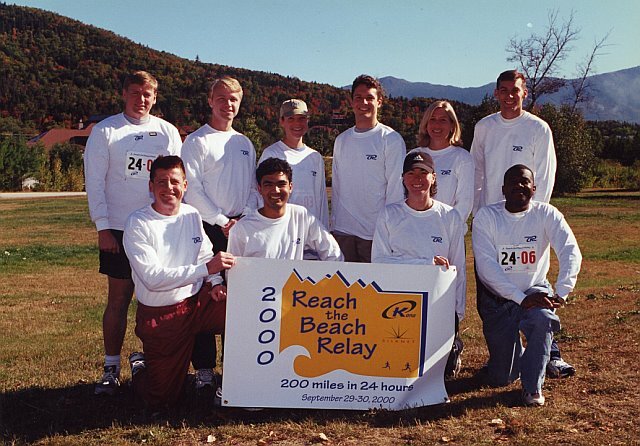 Anuj and nine teammates had to traverse 200 miles over varying terrain in 24 hours. The Kana team competed strongly, overcame numerous physical challenges, and generally had a great time raising money for a number of worthy causes. Anuj with his relay race teammates. Fall 2000. A couple days before the race, in order to round out his team, Anuj called up one of his college friends who was still living in Boston. Anuj told him that he was in the area and asked if his friend wanted to visit New Hampshire and maybe go for a run over the weekend. His friend drove up to see Anuj. Little did he know that the casual run he had in mind would turn out to be a 24-hour relay race across the state! He of course joined the team and enjoyed the experience. To this day, that friend credits Anuj with cultivating his love for running. Six years ago today, our dear Anuj was running across the vibrantly colored hills of New England. We know he had that ever-present smile on his face because he was conquering yet another challenge he had found for himself. 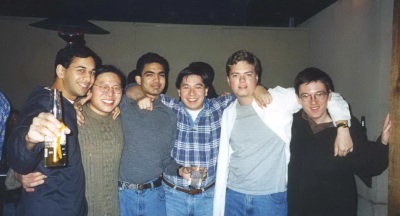 "How I Will Always Remember Him"
Anuj in college hanging out with his fraternity brothers at a party. They came from all over the world to be with Anuj at the hospital. "It has been extremely difficult to comprehend this tragedy and I could not help shedding tears when I heard what had happened. I still remember like it was yesterday that I was rushing, and poked my head to the 3rd North Hallway and first saw some extremely red carpet, followed by seeing an extremely happy Indian guy watching baseball on his TV. I still remember him talking about his experiences in Lucknow and Boston, and had a great time watching the game. Throughout my freshman year (and Anuj's senior year), I will never forget Anuj's appearance, demeanor and personality - always relaxed, laughing, baseball cap usually turned backwards, and always ready to do something fun. I'll never forget doing 6.002 problem sets in the 3rd lounge with Doug Ricket and Will Johnson and having Anuj walk around and lend a helping hand. He had a gift of making everything seem okay and I will never forget his character. It was truly amazing that no matter what happened, nothing could or would ever take that big smile away from Anuj, and that is how I will always remember him." "Love is stronger than death even though it can't stop death from happening; but no matter how hard death tries it can't separate people from love. It can't take away our memories either. In the end, life is stronger than death." 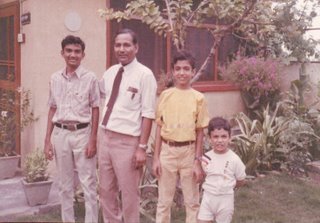 The Mohan men hanging out in the front yard of their home in Lucknow, India. Mom is taking the picture. Anuj is about 12 or 13 years old here. He is of course flashing his trademark easy-going (and in this case, pre-braces) smile. One of Anuj's guilty pleasures was periodically indulging his sweet tooth. Like many of us, he loved chocolate and enjoyed a big scoop of ice cream. Another treat that he had a particular fondness for throughout his life is a simple, rectangular cookie called Parle-G. These tea biscuits, sold in easily recognizable little yellow packets, have been produced in India since 1939. The 'G' stands for glucose and the cookies are known for the immediate sugar-driven energy boost they provide. Immensely popular among Indians of all ages, Parle-G is the largest selling cookie brand in the world. Anuj first discovered them when his family moved to India and quickly fell in love with their uncomplicated, sweet taste. In fact, he took a pack of Parle-G cookies with him to school nearly every day while growing up. All his friends knew where to go if they had a craving for something sweet. When Anuj moved back to the US, he thought he would have to outgrow his love of those cookies. In college and for years afterwards, he enjoyed them only on his trips back to India. A few years ago, he was walking around an Indian grocery store in Silicon Valley, when he came across a shelf stacked with Parle-G cookies. Anuj was both pleasantly surprised and excited that his childhood sweet tooth fix was now readily available in America. He promptly bought a bunch to treat himself as well as share with his friends who for years wondered what he was talking about when he recalled the little yellow packets of Parle-G.
Anuj spent his teenage years attending middle and high school at St. Francis College in Lucknow, India. St. Francis (or SFC as it is known to its students and teachers) is a prestigious private institution offering instruction from Kindergarten through the 12th grade. In fact, for a couple of years, all three Mohan brothers were attending the same school. We hope to share many stories about Anuj during his time at SFC on this blog. In the 12th grade, Anuj was selected to be a Prefect. Every year, a few high school seniors are appointed to this role by the faculty to lead the entire K-12 student body. In order to be considered for this position, a student needs to be at or near the top of his class academically, enjoy success in a wide range of extra-curricular activities, demonstrate the ability to command the respect of his peers, and represent the school well within the community. Anuj of course fulfilled all of these criteria and was selected to be a Prefect in addition to other leadership roles. Anuj receiving his Prefect pin from SFC's principal during the annual investiture ceremony. He was so happy that day. Fall 1993. Reporting to the Head Master, Prefects fulfill a specific set of duties in addition to being ambassadors for the school and setting a good example for the younger children. For a few weeks, Anuj was put in charge of maintaining order among students in the elementary school section of the SFC campus. While other Prefects would yell at the youngsters or intimidate them to gain compliance, Anuj took the opposite tact. Kapil, who was in the 4th grade at the time, vividly remembers him always being friendly with the kids, calmly smiling and joking with them. Anuj won their respect by first earning their affection. After that, it was easy - all the kids were glad to listen to "Anuj Bhaiya" and readily followed his instructions. 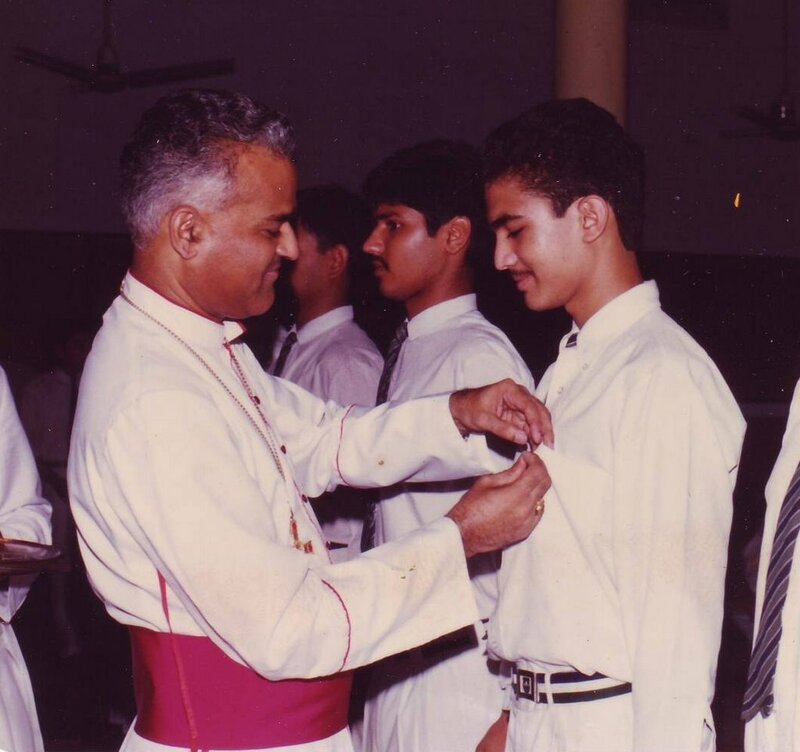 Even at that young age, Anuj displayed the quiet confidence and ability to connect instantly with others that would become hallmarks of his leadership style for years to come. Of course Kapil did not care about any of that. For him, it was simply a treat when Anuj came around to the elementary section because he could show his friends what a cool big brother he had. Registration (very quick process) is required to see the full text of the article. 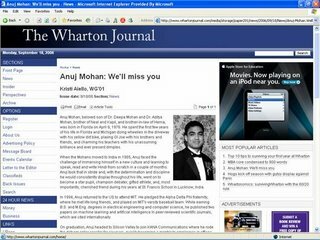 Last week, on September 12, Anuj was honored at a memorial service on the Wharton School campus in Philadelphia. Scores of his fellow students, professors and business school administrators came to pay tribute to him. Vice Dean Anjani Jain began the service by recalling Anuj's intellectual brilliance and wide range of contributions to the Wharton community, both in and outside the classroom, and then recited a poignant verse from the Bhagavad Gita. Reverend William Gipson, the Chaplain for the University of Pennsylvania, talked about how he had come to learn of Anuj's life and his profoundly positive influence on those around him. He invited those present to share their thoughts and memories of Anuj with everyone. Seven speakers, including Neal and several of Anuj's classmates, then rose one by one to eulogize Anuj. The speeches alternatively brought streaming tears, longing sighs, and sometimes even a smile to those in the audience. Everyone highlighted Anuj's effortless intelligence, passion for life, strong work ethic, and desire to build and nurture deep friendships. They acknowledged him as a natural leader who could make those around him better by simply being a part of the team. Perhaps the most remarkable characteristic of the tributes on September 12 was how much in common they had with the speeches honoring Anuj at his service in California on June 15. Every speaker eventually moved from his accomplishments and contributions - which, they all agreed, one would never hear about directly from Anuj - to talk about what type of person he was. That is when vivid examples of Anuj's humility, integrity, selflessness, sense of humor, quiet confidence, reliability, respect for the opinions of others, and unwavering concern for the well-being of his friends, family and colleagues came to light. Every speaker shared examples of how Anuj went far out of his way to help them in small as well as profound ways in some aspect of their lives. Whether it was staying an hour after class to help a friend brush up on his math skills, helping someone find a creative solution to a family crisis without being asked, or simply remembering to find a way to bring a smile to a classmate's face when she was having a bad day, Anuj consistently strived to make the lives of those around him better. It was simply the very essence of who he was. "Imagine a room filled with a hundred unlit candles. Anuj was the candle in the center that lit all of our wicks." 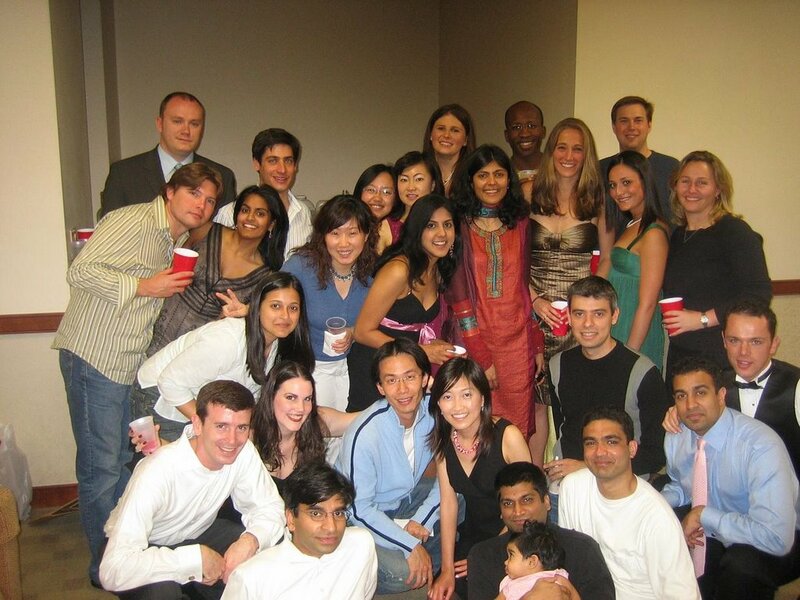 Anuj along with Cohort I at a potluck dinner. Many of these friends attended his memorial service last week. 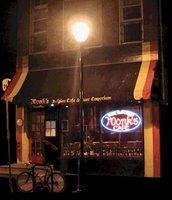 Like many Wharton students over the years, Anuj enjoyed spending time with friends at Monk's Cafe in Philadelphia. This establishment, which refers to itself as a "Belgian Beer Emporium and Restaurant", is located in Center City near Rittenhouse Square. This is an area of town filled with numerous trendy restaurants, lounges and cafes. 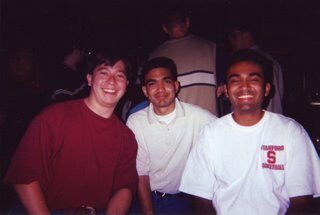 Anuj would go to Monk's to unwind over a pint and share stories with good friends or meet new ones, especially in the spring semester. Many of his classmates fondly recall engaging in long, relaxed, and interesting conversations with him there. Anuj was an incredibly astute listener. Invariably taking an active interest in what his friends had to say, he attentively processed their observations, and offered thoughtful advice, a funny rejoinder, relevant insights, or new ideas depending on what the discussion called for. For his part, Anuj had a genuine knack for telling amusing and entertaining stories, never taking himself seriously, and regaling his companions for hours. He welcomed exchanges on an extremely eclectic array of topics ranging from serious debates over current geopolitical and economic developments to casual banter about sports, movies and music, and from a friend's relationship concerns to his own collection of life experiences. Despite his extremely busy schedule and long list of extra-curricular commitments on campus, Anuj always tried to find time to hang out with classmates at Monk's or elsewhere. This was especially so when he knew a friend needed to talk. 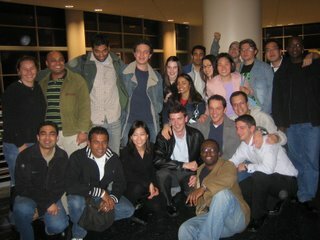 Anuj recognized these relationships as the most enduring things he could take away from business school. He was right. His friends at Wharton will hold him in their hearts for the rest of their lives. To visit Monk's Cafe on the web, click here. Life is of course just a collection of moments and memories. A few of us have the rare ability to make the moments we share with others simultaneously entertaining and enlightening and invariably warm. According to friends who knew him for a lifetime as well as those who met him but a few times, Anuj was just such a soul. Enjoying a happy moment with his Wharton cohort at a 76ers game in Philadelphia. Anuj is at the bottom left. Spring 2006. "Five years ago, on that crisp September day, I was living in Manhattan and witnessed the unthinkable act of destruction from a mile away. After recovering from the initial shock and regaining some semblance of my wits, the first person I tried to call was my brother Anuj, 3000 miles away in San Francisco. In the immediate aftermath of the attack, the phone signals were busy and it took several tries to get through but we finally connected. It was very early on the west coast and Anuj was still in the haze between sleep and the day. Upon hearing my harrowed account, he quickly cut through the initial shock to make sure that I was okay, in a safe place, and could eventually make it home. I, on the other hand, was very concerned for Anuj. Not knowing the extent of the diabolical terrorist plot at that moment, I wanted to make sure that he did not try to go into downtown San Francisco. Anuj's offices were near the Transamerica Pyramid building, which in my mind was certainly a potential target at that point. Although we spoke for less than five minutes and exchanged but a few words, they were enough to convey the strength of our bond amidst the chaos of that day." Five years later, as so many of us reflect on the lives of our loved ones, Neal vividly remembers that short conversation, and we all mark three long months. Just as the nearly 3000 souls are with their families for eternity, we know Anuj will always be with us. Anuj's blog received its 5000th unique visitor yesterday. Friends from around the world have visited and continue to spend time on this site. We want to thank each and every person who has done so over the last several weeks. You will always be welcome on this ever-changing memorial for our beloved Anuj. We also appreciate the comments, tributes, emails and other messages that have come in from those who knew Anuj as well as those who didn't but were moved by his story. By spending a few minutes periodically to reflect on his life, his contributions to the world, and the legacy he left behind, we feel that you are honoring Anuj and hope that you leave the website inspired. Your response has shown that he will continue to live on forever in all of us, and for that you have our sincere gratitude. It gives us the strength and passion to keep growing Anuj's blog. Please click here to share a thought. 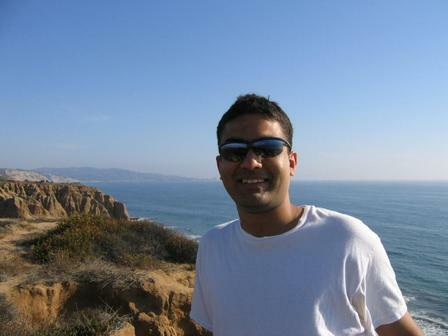 Anuj spent the majority of his professional career at Kana, a Silicon Valley software company building multi-channel customer service products. Despite the fact that it is much smaller today than during its heyday in the dotcom era, Kana serves over 600 customers worldwide including half of the Fortune 100. Companies like eBay, Yahoo!, Dell, Citigroup, and Bank of America are among its customers. While at Kana, Anuj enjoyed a remarkable career trajectory starting as an eager young engineer right out of MIT and progressing to his final role as Managing Architect. He genuinely enjoyed this last job because it allowed him to combine his exceptional technical ability with an abiding interest in building businesses. Anuj led by example, always making sure that he remained an approachable member of the team while simultaneously serving as a mentor to those who worked for him. In his capacity as Managing Architect, a position he held for nearly two years, Anuj was responsible for the product design and development process - from initial business conception to maturity - for Kana's primary businesses. He managed Kana Service, the flagship product line representing about 50% of its revenue. Anuj oversaw a global engineering group with R&D teams in the US, India and China. In addition to the core suite of products, he helped build out and launch the Service Resolution Management product line, thereby enabling an entirely new revenue stream. Given his business acumen and presence in front of clients, Anuj also handled the company's most strategic relationships from a technical standpoint. As his Kana colleagues have shared, Anuj's contributions to the company were innumerable. In his last role he left his colleagues with a robust set of products and core platform architecture, an engineering process that is 150% more efficient than before Anuj took over, and many memories of happy lunch conversations and hallway chats. Anuj was proud of his work and would spend time with his team at all hours of the day to ensure a product's success. In subsequent posts, we hope to cover the rest of his career progression including a few dotcom stories from along the way. Anuj sharing a happy moment with friend Grant and brother Neal, in Boston. Spring 1998. 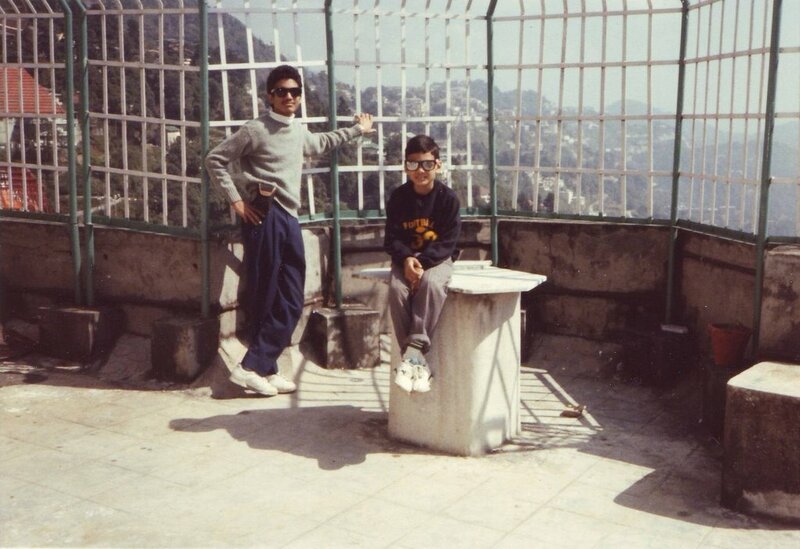 Anuj and Kapil enjoying a view of the Himalayas in Mussoorie, India. Two cool dudes on top of the world! Fall 1992. Last week, US News and World Report came out with its much anticipated annual college rankings guide. At the top of the list this year is Princeton University. This was one of the schools Anuj wanted to apply to as a high school senior. As luck would have it, the application materials from Princeton were among the last to arrive at his house in India. By that time he had already applied to a number of other colleges. Back in the early 90s, currency was tightly controlled in India and each household could only convert a certain amount of rupees into US dollars for college application fees. Unfortunately, when it was time for Anuj to apply to Princeton - the last school on his list - he had used up his quota of dollars. He asked several banks to see if there was a way around this restriction but it appeared to be an insurmountable hurdle. 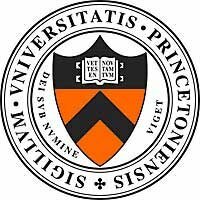 Since he had applied to several good universities already, and fees were an important component of any application, he was advised to give up on Princeton. However, Anuj never let any impediment, whether big or small, get in the way of his ambitions. On a train ride back from New Delhi, where he had gone to take the SAT, Anuj had an idea. He would apply to Princeton, submitting the entire set of forms, essays, transcripts, etc. but also attach a letter explaining the difficult situation he was in and why he could not include the application fee with his material. He indicated that he would gladly pay the application fees when his quota was refreshed in a few months. After a few weeks of waiting, Anuj received a note indicating that his application had been accepted. The university of course was much more interested in evaluating the credentials of an ambitious and enterprising youngster than collecting a few dollars in application fees. When decisions started rolling in, Princeton was one of the first places Anuj heard from. The short telegram declared that he had been admitted to the Class of 1998. He was extremely delighted. While in the end Anuj chose to attend MIT, it was his decision to take a chance at Princeton that stands out as the truest indication of his unrelenting determination and perseverance. During his time at Kana, Anuj was known as many different things - a brilliant software architect, an inspiring and effective leader, the level-headed go-to guy in tough situations, a trustworthy friend. However, some of his colleagues also knew him as a regular participant in the periodic break room poker game. Anuj developed an interest in this game of strategy and luck because for him it was a great way to spend quality time with friends while satisfying his desire for competition. He not only played poker at Kana but also hosted occasional Saturday night games at his apartment. These gatherings involved good food (sometimes cooked by Anuj), entertaining conversation, and decidedly low stakes. Anuj playing cards with friends in college. As any avid poker observer will attest, in addition to luck, success requires two key skills: bluffing and the anticipation of opponents' moves. Anuj was great at the latter but, as any of his friends would guess, not very good at the bluffing part. This made for a poker player who was a master at the strategy necessary to win but not so great at the deception required to execute on that strategy. This was just fine for Anuj since he played mostly for fun. However, his competitive side made sure that he won his fair share of games as well. Given the low stakes, at Kana that often just meant a free lunch. 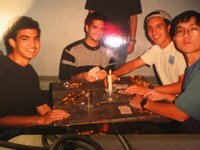 What his poker companions remember most is that whether he was dealt a good hand or bad, Anuj was always smiling and optimistic. This of course is also how he lived every day of his life.